Can-Am® ATV and side-by-side racers competed at the 2014 Heartland Challenge endurance race, the Vegas To Reno Best In The Desert series and round eight of the New England ATV Motocross series, earning podiums in all three events. The 2014 Heartland Challenge endurance race in Carlisle, Iowa, featured classes for side-by-sides and both 4x4 and sport ATVs. Three classes (800cc, 900cc and Open) of side-by-sides competed during a four-hour format, while the ATVs, which included Pro, Series Challenge, 4x4, Ironman, Women’s and age classes ran for 10 hours. Marcus and Mouse Pratt of Team Jack’s Excavating / Can-Am won the UTV Open class in their Maverick. The Pratt brothers excelled during the four-hour side-by-side portion of the Heartland Challenge, winning their class and taking the overall victory as well. The team didn’t get the best start and ended up taking a wrong line, which ultimately forced them to make up time. However, they stayed focused, remained patient and meticulously picked off competitors one at a time on their way to the front. “We had a hiccup at the beginning, but we just took our time and started picking them off one at a time and conserving our vehicle. The Maverick was unbelievable today, and between Mouse and it, they were a force to be reckoned with today,” said Marcus Pratt. 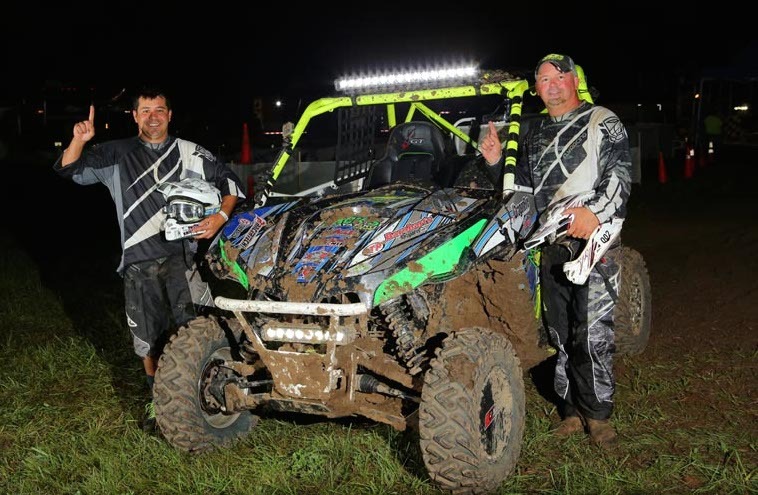 Hunter Miller and Cody Miller (Louis Powersports / Can-Am) competed In the ATV Series Challenge class, representing Team Texas Quad Racing Association (TQRA). The two-man team won their class and ended up second overall, logging 36 laps in a time of 10:11.01. “We had an awesome race. Our Can-Am DS 450s ran great with Elka shocks. We just tried to keep it consistent, because it got a little rough at the end. We got the lead after about eight laps and just ran a good race and took the win,” said Cody Miller. Team Trantham (Kevin Trantham and Mike Edwards) claimed the 4x4 Pro class win for Can-Am and took fourth overall out of 70 teams. The team led the 4x4 pro class from start to finish, and ran so well that they used the same Outlander for all 10 hours. The Hicklin Elite team claimed second in the 4x4 Pro class on a Renegade 4x4. 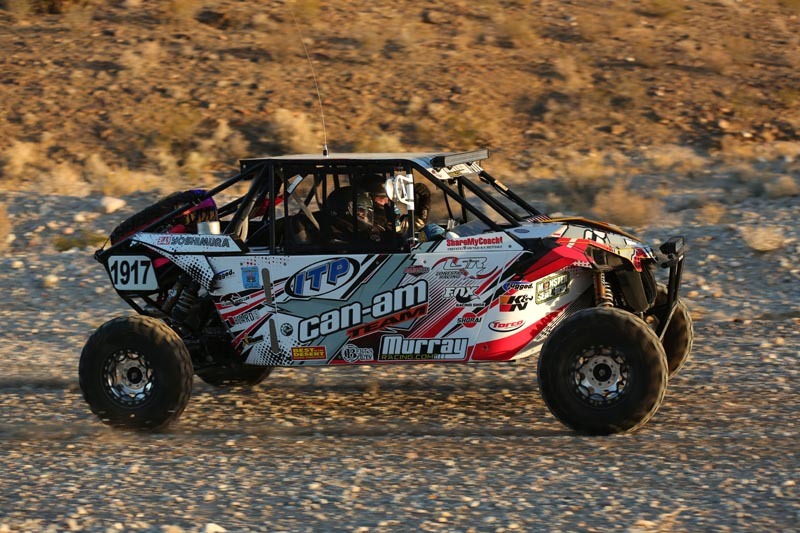 The No.1917 Murray Racing / Can-Am Maverick piloted by brothers Derek and Jason Murray, claimed third in the 1900 P class at the 2014 General Tire BITD Vegas-To-Reno race. The Murrays compiled a time 25 minutes faster than their winning time of a year ago, but the 2014 V2R course was more challenging and competition more fierce. Derek Murray started in 18th and covered the first 200 miles rather easily, picking off roughly 10 other teams along the way. Jason took control from there and, over the course of 200 miles, put the team into third place. With Derek back behind the wheel, the team held onto the No. 3 spot all the way to the finish. It was the Murray’s best BITD finish of the year. The NEATV-MX series stopped at MX207 in Lyman, Maine, for round eight, a rain make-up date. Can-Am racers Travis Moore, the defending Pro class champion, and Mike Troiano both scored podiums. Travis Moore tallied 4-3 moto finishes for third place in the Pro class, allowing him to keep his points lead. Troiano returned to the NEATV-MX series after taking a personal break. He notched his first Pro-Am overall victory with a 2-1 scorecard. “It’s super exciting to be able to get my first overall win and especially on the Can-Am, which I love racing. This year has been super hard on me. I just needed some personal time to take off from racing and recoup, and it showed here today,” said Troiano.